this basil may live in this tray forever. It doesn't seem to mind and we are making pesto. Copacetic. A lot of our useful plants are growing in containers close to the kitchen. I hesitate to admit sometimes those containers are not the pretty ones you see in pictures. Quite a few are small enough to fit on the windowsill! And yet, they contribute so much to our diet and our lifestyle! All these plants will need to be watered when they wilt and fertilized regularly. We will concentrate on plants that produce food quickly and easily. Arugula - Grows so fast and is so indestructible that we grow it as a test crop at the farm in areas where we have killed many other crops. It's in the lettuce family so just follow the lettuce directions below. Lettuce - This plant grows amazingly fast and is really hard to kill. It doesn't like hot weather, so the windowsill is the perfect place all summer. If your seed starting skills aren't so great, buy starter plants. Harvest the outside leaves and they should regrow from the center in about a week. A four-inch container will work. Trade up to a larger size after you master that. 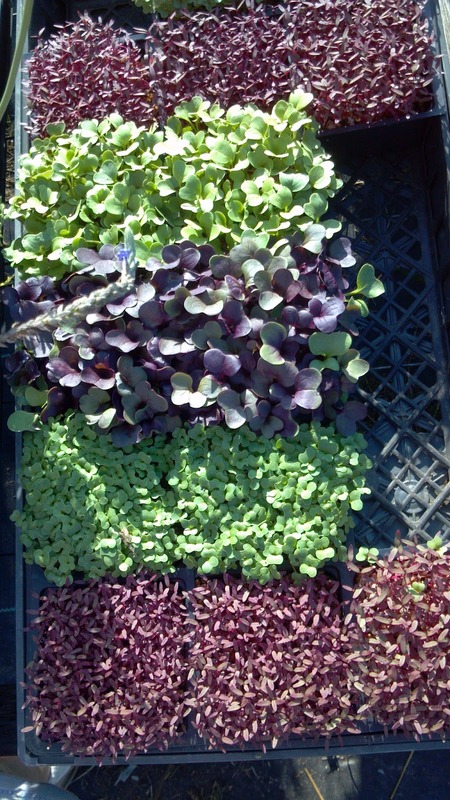 Try lots of varieties in lots of colors. They all have slightly different nutrients. Green Onions - This is one vegetable that always goes bad in my refrigerator before I use them all. But they can grow in the soil until I am ready to use them! Buy a bag of "onion sets" in the Spring and keep it in the pantry. Plant the tiny bulbs in a 4-6 inch pot, close together. They grow quickly. As you use them, replant with more little bulbs from your bag in the pantry. This will work better inside on a windowsill in summer because onions don't like hot weather. Peppers - Pepper plants don't get super huge like tomatoes and they come in so many varieties! Grow one you would like to use more of in your cooking. The plant size will be roughly the size of the root ball. A six inch pot will work for most varieties. Just be sure to water it when it wilts. You might want to put it outside when it's blooming so the bees can pollinate it. You can also hand pollinate. 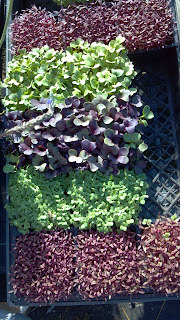 Microgreens - If you haven't read my blog about growing these or watched the YouTube video, you will want to! Basically, you can grow some sprouts in a week. Then they are chopped off and eaten. You will have to replant each week, but it's a 5 minute task. Fast, easy vegetables in a variety you you choose. If you don't like spicy, choose tatsoi. If you like spicy, choose Rambo Red Radish. 4 inch pots make for an easy tip-and-chop harvest. Basil - The bigger the pot, the bigger the plant and thus more basil per plant. 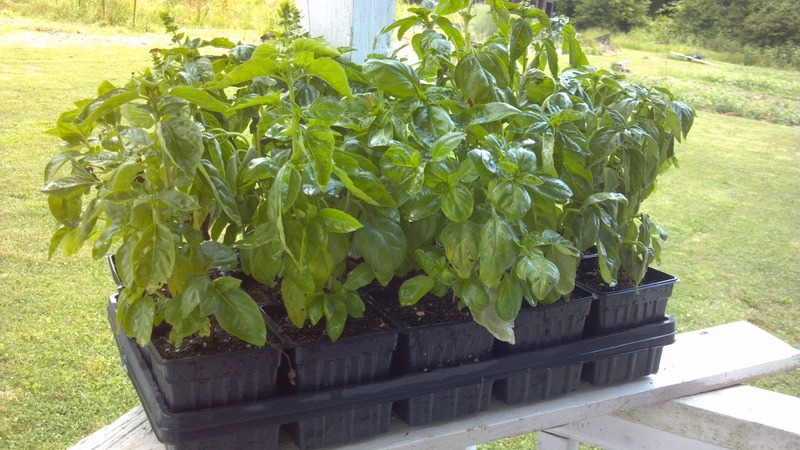 But you can grow several small pots and still produce enough basil to make pesto once a week. There are several medium-sized varieties like African Blue or lemon basil that will be just fine in six-inch pots. (Mini purple and spicy globe will not grow quickly enough to make pesto once a week.) In hot weather, basil grows back about once a week. The plants will grow faster and sturdier outside in summer because basil likes heat. Patio table or balcony is great! Carrots - These have a tap root and don't get very large - so several can fit in one container. They don't like hot weather, so only put them outside when the weather is mild. Have patience. They take a long time. Radishes - Grow SO fast! Even in terrible soil! Plant the seeds about 2 inches apart. Keep them watered and cool. Celery - You can plant the stump you have left after you use the celery you bought from the grocery store. You will see growth in a couple days. It takes a little while to get enough to cut. You can also cut a few leaves to use and harvest form the outside as it grows. That makes for 9 useful vegetable plants to grow in small containers in small places. I make a glaze with burnt umber and another with burnt sienna. The two together over your yellow will soften and age the walls. Does this have something to do with vegetables? It is also very easy to dig. In this type of soil your veggies will grow like crazy. So start making that vegetable garden design, you don't need to do anything to enhance this type of soil. Principles of planting various plants on the same area. It keeps the soil healthy.